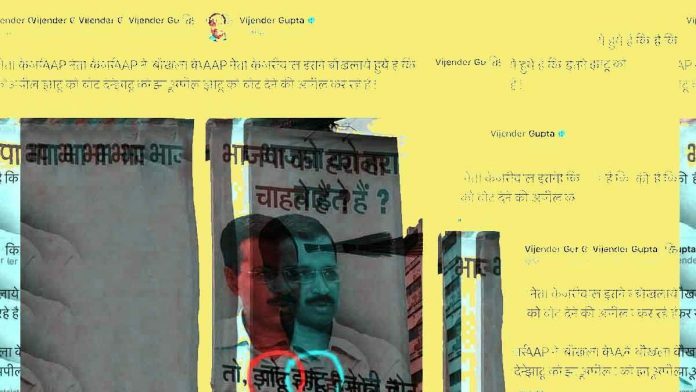 New Delhi: With the election season well underway and political parties upping the ante, Delhi’s Leader of Opposition Vijender Gupta took to social media to slam the Aam Aadmi Party (AAP). The Bharatiya Janata party politician Saturday tweeted a poster of Delhi Chief Minister Arvind Kejriwal seeking votes but with a caveat. “BJP ko harana chahte hain? Toh j****u (an abusive word) ko hi vote dena,” reads the image posted by Gupta. The image has over 8,000 likes and nearly 3,000 retweets. Also read: AAP-Congress alliance failure: Political myopia or risky to tie up with Arvind Kejriwal? The image shared by Gupta with the abusive word has been photoshopped. A closer look at the altered word shows that the text has been modified to read as the expletive. The original image reads, “BJP ko harana chahte hain? Toh jhaadu ko hi vote dean.” Jhaadu, or the broom, is the AAP’s election symbol. Social activist Dhruv Rathee even countered Gupta’s claims by highlighting the word to show it had been altered. “(Gupta uncle, have you phtotshopped this image yourself or did you ask a BJP IT cell worker to do it? ),” Rathee tweeted. “Even when it comes to spreading lies, you guys are lazy,” he added. The AAP has been attempting to consolidate its vote bank in Delhi on an anti-BJP poll plank. The party has been in talks with Congress for a possible alliance in the state but they have hit a wall.